Shirley Ann Martin, age 70, of Juda, passed away on Wednesday, November 29, 2017, at her home. She was born on August 23, 1947 in Freeport, IL, the daughter of Robert and Bertha (Ubben) Klever. She married Clifford C. Martin on March 21, 1964 in Davis, IL. Shirley was devoted and hard working farm wife. Clifford said she was his right hand. She loved cats, cooking, flowers, antiques and collectables, going to flee markets and caring for her children. 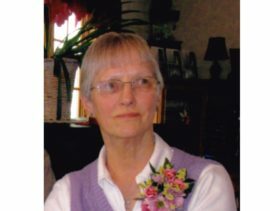 She is survived by her husband Clifford, Juda; three daughters, Amy Schmidt, Rockford, IL, Tammy (Mike) Goecks, Juda, Melissa (Chris) Dolle, LaCrosse, WI; three brothers, Burdette (Janice) Klever, Larry (Dorothy) Klever, Bob (Pam) Klever; and a sister, Pat Althafer, all of Davis, IL; five grandchildren, Sophia and Garbriella Schmidt, Morganne and Alexis Goecks, and Braeden Dolle. She was preceded in death by her parents and a brother-in-law, Donad Althafer.